I was recently asked a question from yhg regarding one of the behaviors of coherance in the "Source Sync" technique as provided for us in the Temple of Spiritual Activism paper. I am grateful for yhg's question as it gave me an opportunity to go back into it and attempt to more fully comprehend & integrate it in life. This is a segment from my response that assisted me in my journey to understand it in a way that felt significant, I decided to also share it here in case it can also be a catalyst for others on their journey. Any further input and clarification would be gratefully received. Behavior 3 from the Source Sync technique = Allowance : To release any sense of "ownership" that we may have to the energy/consciousness that emerges within us and through us. One way that helps to understand this more clearly is to think of it as being connected to the Heart Virtue of Humility and also to link it to the WingMakers Philosophy Chamber 1 "Life Principles of the Sovereign Integral" : most specifically the 2nd Principle "Observance of Source in all things"
It means to allow Source to emerge through you and as you so that the Symphonic Vibratation and Harmony that is the actual Nature of First Source can work its magic in your life by being able to resolve and solve any energetic discordance that you/we as human beings of life often experience. So in a sense it means we sometimes need to have the courage to let go and surrender into the Oneness and Union of Divine essence that is our true nature... the only thing that gets in the way sometimes is the illusion of the Human Mind System and our own mis-identification of self-importance, status and power which are all parts of the ego-personality. Such things can "get in the way" of the natural flow of Source within us, through us and as us. Thanks for posting that, Michael. "audio" it will take you to them. They are the first ones listed. You might find them of help. We have gotten comments from all over the world as these podcasts have helped people. When I am focusing on "Allowance" I usually come to my breath.... For me, they seem to go hand-in-hand. As I am feeling myself breathing, it helps me to 'let go' and open up, become 'still'. I would like to stay in a state of 'allowance' all the time .... still working on it! • Dissolve personalities and projections. Allow. Dwell in stability, inevitability and stillness. Let the universe that surrounds you refresh itself and transform. Observe the re-gridding, the re-formatting of your environment. As with any of the study group notes that I personally place on the WingMakers discussion board please feel free to contribute your own personal analysis and intuitive insights. If we are open, receptive and generative in our sharing this can potentially be of great benefit to one another, and also to any future waves of individuals who may be guided to these discussion topics during their own personal journey of interaction and discovery. ۞ “What happens for many spiritual seekers is that they begin to teach the information gleaned from their Deep Dive as a form of “truth telling,” and in the process they fall back into separation.” James explains how this can often keep the seeker in a vibrationally dense paradigm cycle (in the form of judgment, ego, ignorance etc). 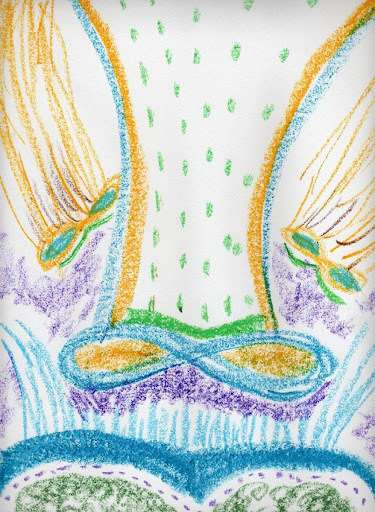 ۞ It is not until the seeker ultimately begins to realise a deeper and more encompassing level of authentic self identity they can move out of the lower cycle and into the spiral adventure of coherent energetic transfers. e.g. in realising that they are connected to more than what is only contained within their human instrument. • First Source is an all-embracing field of inter-connectedness and Love. It is the Blossoming Oneness of our infinite unity. • In order to transcend the continual cycle of disagreements and arguments we must move out of the consciousness of polarity. • Neutrality creates a bridge/platform of Oneness and Unity. • Become your core identity. • We become carriers and instigators of Divine Love. ۞ It is possible to use our Spiritual Center to interact with our local universe, which enables us to utilise the quantum states we dwell in as a means of energetic contribution. • It is important to learn how to interact with life from the vantage point of your Spiritual Center. • To live from the Spiritual Center enables us to interface with the Sovereign Integral consciousness and to form a quantum link with one another through an interconnected field of Oneness and Unity. • By regularly going into their Spiritual Center it is possible for an individual to regularly break through their thresholds of density into a state of Sovereign Integral consciousness, enabling them to contribute as individuals and to share collectively with others within a process of co-creative interaction and transformation. ۞ The diagram on page eight of the paper depicts the Quantum Perspectives of the Spiritual Center, specifically the four states of being (Facilitation, Observance, Guidance, Co-Creation). These states of the spiritual center are analogous to “spokes” radiating outwards from the central hub where the “Vibration of Oneness” is stationed. ۞ Coherence from this perspective is more focused on the “Presence of Allowance” and it enables an individual to experience, explore, and embrace their interactions with their universe at an energetic level (from the four perspectives/states of being), instead of the human tendency of focusing predominantly on human instrument survival and transient desire identification. ۞ Coherence connected with a presence of allowance provides a form of innate empowerment derived from the natural act of allowance. • The intrinsic truth of our original identity as it relates to our core foundation of Being, is actually the Spiritual Center... it is our Soul’s Vibration of Oneness and Wholeness. ۞ If you can couple the four perspectives or states of being with the expression of your heart’s virtues, then you are practicing spiritual activism at a profound level. ۞ Alignment is a form of attunement, and in the case of spiritual activism it becomes a personal choice and responsibility to attune oneself within a more coherent alignment towards the states of being derived from our Spiritual Center, rather than getting too caught up in the de-coherent manifestations that often run rampant through the many enticing fields of temptation and drama. * note: that is my choice of wording, which could be a bit over the top ? • The spiritual activist seeks to transform the indoctrinated societal construct of polarity and separation, gradually assisting with the progressive transformational process of our species collective consciousness, bringing it more into harmonic attunement with the Vibration of Oneness. • Alignment and coherence with one’s Spiritual Center is a vital component of integration with the Sovereign Integral Consciousness. • Observation enables an individual to be aware of the social entrainment and trappings of the Human Mind System. For if we are not aware of it then we are more likely to be at the whim of being controlled by it. • It is important to understand where we come from as a Quantum Presence, as opposed to a personality or ego. ۞ This is a method to enhance the synchronization between one’s personality and Spiritual Center. It can be used to maintain your focus on your Spiritual Center throughout the day, and consolidate you emotional energies so they remain more open to the nudges and whispers of your Spiritual Center. * We were reminded that “Source” is not an entity – IT is a Symphony of Intelligent Vibration. * To experience Source, you have to tap into that Symphony. * In every effort you make to reach into the deeper structures and flows of your Spiritual Center, you move closer to the Living Presence of Source. * It is important to be consciously aware of the energetics of what is transpiring. * We spoke about the name “First Source”, “God”, “Creator”... and the all-encompassing depth of that which it truly represents; The Living Presence of our Source as a Symphony of Vibrational Intelligence. Synchronize: Spiritual activism is a process, but it is a quiet, deeply personal process... you will gradually become less suspicious of your external world and simply more connected to your heart. * This place of Beingness is not without its difficulties... have compassion for your yourself and anyone else who is on this path, the human condition is very challenging. Resonate: This is about connecting in resonant communication with the Universe. It is the formation of a Sovereign Integral bond that you are having with the Universe that will help you to be able to simply allow it to work through you in resonance. Emanate: When an individual is able to discover and access their Spiritual Center, a flowing emanation of the Spiritual Center’s qualities will occur through them. This flow will become stronger when we adopt the specific perspectives of the Spiritual Center (Facilitation, Observance, Guidance, Co-Creation). ۞ Emanation is the goal of the spiritual activist... it is the quiet, unobtrusive frequency of equality and oneness. * We must apply this awareness as an actual practice within our lives; we must Be the Living Truth of the Heartfelt Experience. Please feel free to contribute your own personal analysis and intuitive insights. Openness, receptivity and generative sharing is of benefit to One and All... and also to any future waves of individuals who may be guided to these discussion topics during their own personal journey of interaction and discovery. 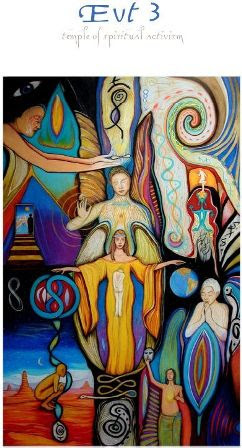 ۞ “The One Entity” as depicted in the diagram on page 17 is another way to look at our self in the mirror of vibrations. * The diagram depicts the outward flow of the energetic frequencies of the Spiritual Center connecting with and interpenetrating the life of the Individual as it relates to their local universe, consciousness and timespace. ۞ The key to spiritual activism is to connect with our Spiritual Centers and to open our human instrument to express the energetic frequencies therein. ۞ “All living forms of consciousness are connected to the Sovereign Integral consciousness, enmeshed within the Grand Presence of the Universe." * If you hold the awareness of the Wholeness Paradigm within your heart, it will help you integrate and ground your feeling of Oneness. * Practicing with the intention of the purity of the heart is the key activation and contribution from the individual to the whole. * The Wholeness Paradigm is like an all-encompassing membrane of which we are individual cells within a vast network of interconnectedness, unity and wholeness. ۞ This particular section also explained that the poem (and its accompanying video) “I Live Where You Live”, is a poem written from the perspective of the Wholeness Paradigm. It refers to the Sovereign Integral. ۞ In this section James expressed the fact that Spiritual Activism serves the most basic need of our human family to reconnect with its Spiritual Center without the polarization of religion, government, education, or social conditioning. * These challenges are predominantly a result of mankind’s temporary refusal to live in harmony with the synergy of nature and thus becoming disconnected, and stuck in the old mental paradigm of polarity and separation. * This EVT 3 paper also reminds us that we are each part of the transformation that will occur for humanity. Thank you for these study topics ... what I found most significant (to me) in this reading, of that section of the Spiritual Activation guide are these statements: starting with the last line of the paper (as you mentioned above) I've added emphasis to focus my understanding ... by taking it one concept at a time. as before, forgiving the hypocrisy of believing one thing and acting another. Authenticity and behavioral intelligence are the watchwords of this new era. Please take this to heart. Everything depends on it. We use instinct, intuition, and intelligence to sense and navigate. Instinct consists of a field of programs embedded from nature. and are accessible at the quantum levels. your ability to express this coherent vibration through their behaviors. and this one, that you pointed out above - so "timely"
Thank you starduster I appreciate your input and contributions to this thread. It has been a good journey to re-immerse within the EVT 3 paper "Temple Of Spiritual Activism", as with all of the Wingmakers/Lyricus materials there are many important gems of awareness, understanding and activation awaiting our personal discovery and implementation in life. The following sentence I agree is very integral and vital... "Authenticity and behavioral intelligence are the watchwords of this new era." It is all about Attunement to the Energetic Heart in conjunction with the Higher Mind... this concept also feels to be one of the major priorities for us to focus on. The next quote that you resonated with is just something that I jotted down after being inspired from the study of the Temple of Spiritual Activism paper * These challenges are predominantly a result of mankind’s temporary refusal to live in harmony with the synergy of nature and thus becoming disconnected, and stuck in the old mental paradigm of polarity and separation. It was interesting that the words "mankind's temporary refusal to live in harmony with the synergy of nature" ... seemed to strongly emerge... it holds a feeling of hope and trust in our individual and collective ability to not only rise up with a renewed sense of self-awareness but also to have the deep courage and commitment necessary so as to change and transform.